This is after the insurance firm increased the overall sponsorship perk to Sh1.4mn per season for the new year. Fidelity managing director, Matthew Koech, touted their desire to develop talent throughout the country by motivating coaches as the reason the insurance firm decided to increase the cash award. “Despite the challenging economic times in the..
Jolly old Paul Nkata is the Fidelity Insurance Coach of the Month for November. The title winning Tusker fc tactician eventually landed the gong in the final month of league fixtures despite keeping the brewers atop for seven months. Having recorded 100% victories in November, Nkata, alongside Posta Rangers stand-in coach Pascal Ochieng and Sofapaka’s..
Fidelity insurance has partnered with PESABAZAAR.com, an online insurance comparison and aggregator platform to sell our insurance products online in Kenya. PESABAZAAR.com is an accredited insurance agent of Fidelity Insurance and it is licenced and regulated by the Insurance Regulatory Authority (IRA) of Kenya. 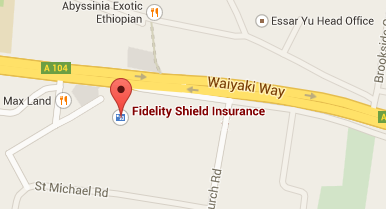 It was founded in 2015 in Kenya and launched operations early..
Are you Insurance Premium bills weighing you down? Insure through Fidelity Shield Insurance Company Limited and get to enjoy Spire Banks’ amazing lending rates on Insurance Premium Financing Loans! Under the arrangement dubbed ‘The Scheme’, Spire bank will provide its individual, SME and corporate customers with flexible repayment options on all annually insurable risks such as..